George Colin McKee, legislator, born in Joliet, Illinois, 2 October, 1836. He was educated at Knox college and Lombard university, Illinois, and admitted to the bar in 1858. After practising law at Centralia, Illinois, he volunteered as a Private in April, 1861, in the 11th Illinois regiment, became Captain on its reorganization, and served throughout the war in various capacities. He was wounded at Fort Donelson, Shiloh, and Vicksburg, commanding a picked corps during the siege of the latter town. When at the head of his own regiment and other detachments, on the second Yazoo expedition, he defeated the Confederate assault at Yazoo City, 5 March, 1864, after which he was ordered, as Brigadier General, to enroll and equip four regiments of colored militia. He was appointed register in bankruptcy in 1867, and was a member of the Constitutional convention of Mississippi. He was elected to the 40th congress, but his state was refused representation, and, being re-elected, he served from 23 February, 1870, till 4 March, 1875. Since the close of the war he has been postmaster, and practised his profession, at Jackson, Mississippi. He has invented a cotton-press, which he patented 3 April, 1877. George Colin McKee, a Representative from Mississippi; born in Joliet, Illinois, October 2, 1837; attended Knox College and Lombard College, both at Galesburg, Illinois; studied law; was admitted to the bar in 1858 and commenced practice in Centralia, Illinois; city attorney of Centralia 1858-1861; served throughout the Civil War with the Eleventh Regiment, Illinois Volunteer Infantry; resumed the practice of law in Vicksburg, Mississippi, and engaged in planting in Hinds County; appointed register in bankruptcy in 1867; member of the State constitutional convention in 1868; elected as a Republican to the Fortieth Congress, but his credentials were never presented to the House; elected as a Republican to the Forty-first, Forty-second, and Forty-third Congresses (March 4, 1869-March 3, 1875); chairman, Committee on Territories (Forty-third Congress); was appointed postmaster of Jackson, Miss., and served from June 28, 1881, to November 12, 1885; resumed the practice of his profession; receiver of public moneys from 1889 until his death in Jackson, Mississippi, on November 17, 1890; interment in Greenwood Cemetery. Please note that the above congressional biography is in error. 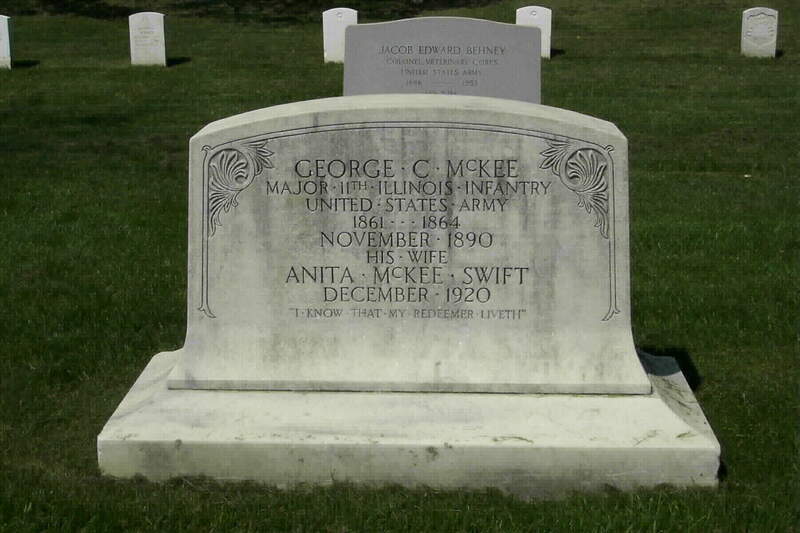 Per the photos below Representative McKee is actually buried in Arlington National Cememetery together with his wife, Anita McKee Swift. 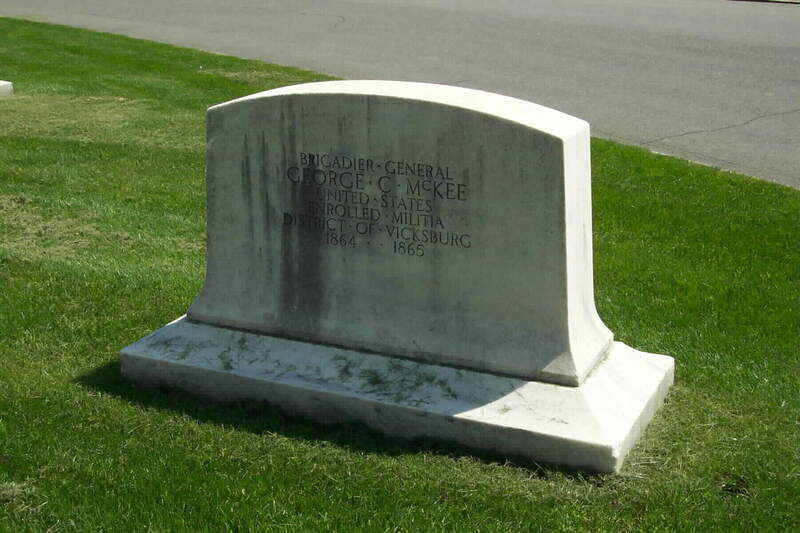 JACKSON, Mississippi, November 17, 1890 – General George C. McKee, Receiver of Public Moneys of the United States Government, died at his residence here this morning, after an illness of several weeks. The immediate cause of death was a complicated heart trouble. 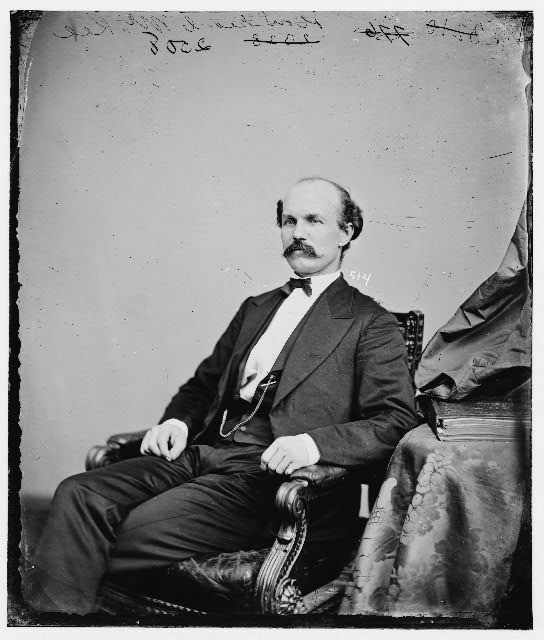 General McKee was practicing law in Central Illinois previous to the late Civil War, and entered Federal service at the opening of the fight and rose to the position of General. As a soldier and commanding officer, General McKee enjoyed the full confidence of Generals Grant and Sherman. Subsequent to the war, General McKee removed to Mississippi and entered politics and represented the Grant Administration and has since held several Federal offices of prominence.